Group photograph of Reception attendees courtesy of Neil Abeles. Click photo to enlarge image. The Linden Heritage Foundation’s reception honoring Charter Members was a delightful evening graciously hosted by Ruth Halleck on April 23, 2016. 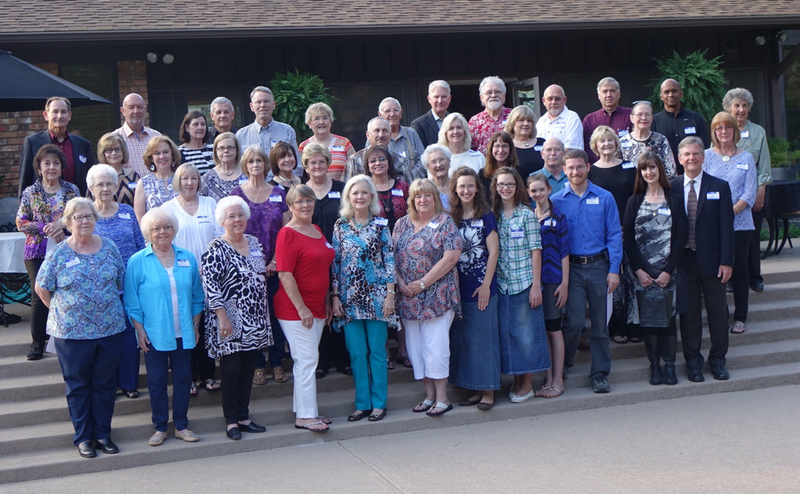 Attendees came from Arkansas, the Dallas-Ft. Worth metroplex, South Texas, and Northeast Texas. Hospitality Committee members Mary Janet Allen Wells, Charlotte Bennett Wells, and Wanda Ayers Burns did a fantastic job with refreshments, name tags, and door prizes, and gave all a friendly Linden welcome. President Sam Higdon welcomed everyone, presented certificates to Charter Members, introduced Directors, and reiterated the importance of the Foundation. From Joe B. Lovelace, members and guests learned details of the Firehouse Rescue Fund Campaign. 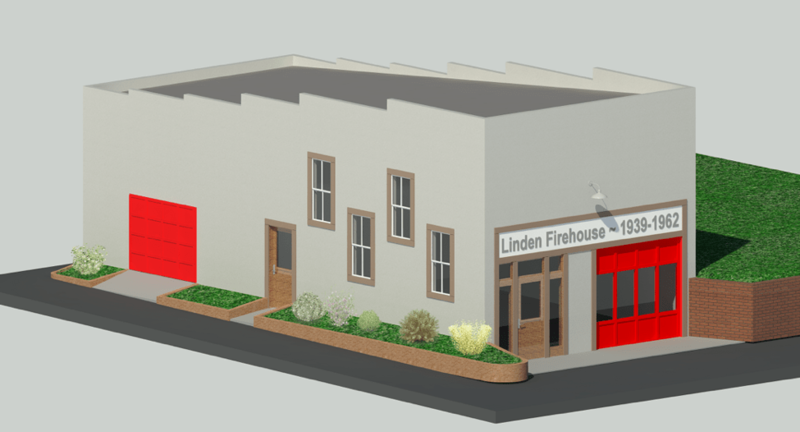 Conceptual computer-rendered image of 1939 Firehouse after restoration. Click image for enlargement. Sue Morris Lazara spoke about the Request for Proposals for commercial development of Linden’s 1934 Water Tower as well as restoration of the 1939 Firehouse. It was exciting to see LeTourneau University senior engineering student Lucas Allen’s post-restoration rendering of the historic Firehouse. Ed Sergeant explain his concept for the preservation and repurposing of Linden’s 1934 Water Tower and 1939 Firehouse. 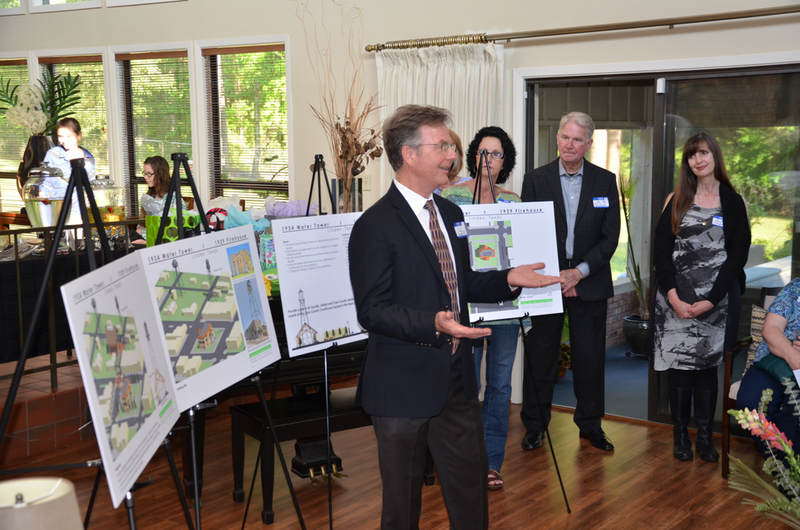 Historical-restoration architect Ed Sergeant displayed and discussed his conceptual rendering of the restored Water Tower, Firehouse, and surrounding area. His wife Laura joins him in enthusiasm about the Foundation because generations of her family have been Cass County residents. The Foundation thanks Jo Anna Duncan and Neil Abeles for their expert photography during the evening, and to businesses and individuals who furnished door prizes. Above all, the evening would have been impossible without the Linden Heritage Foundation Charter Members whose valuable support is important now and in the future. The Foundation is also grateful to our Parliamentarian, Kay Temple Stephens, for preparing this summary of the Reception. Its is wonderful to see just how the Foundation has moved so far forward in such a relatively short space of time. Congratulations to everyone. I felt so honoured to receive my Charter Member Certificate in this today’s post. It cheered a rainy English morning as I sat back with a cup of tea in my hands and thought of those days, late last summer, spent among friends in Linden, Texas. I’ll be back to see the work “y’all” are doing! Sad that I wasn’t able to join in the festivities and have my Chater Member certificate officially placed in my hand instead of in my mail slot by the mail carrier. It’s very nice to at least see some of those faces of fellow members. I’m happy to be able to take part, to a degree, in the progression of good things to come for Linden.